I wonder if some sites ever went through usability testing. The Audi e-tron concept website definitely suffers from some significant design issues. First of all it contains no obvious cues about what one gets when clicking on the icon based navigation elements. There are four key video content elements in the right-hand navigation featuring futurist diagrams and computer-generated imagery (CGI). Navigation includes design, technology, the intelligent automobile, and interior concept all visually demonstrating the e-tron’s features. The problem is each link is a tilted image not easily showing what the image is or what one sees when it is clicked on. In fact, the titled image navigation doesn't even seem like a navigation, you only know because your mouse changes its icon. One demonstration is a nod to a future interior concept that seems very close to what might happen in the next few years. For example, a “Streets of Tomorrow” demonstration shows how the navigation of the future will tell us when we need milk as we are passing a grocery store. I think I heard this idea in 1998, but hey it still has never been done and people keep suggesting it. Telling me it is an idea no one wants, but keeps coming up in brainstorming or there is some technical barrier, I'm guessing the former. Another example is the car diagnostic system showing actual psi ratings of the tires is far more advanced than the Tire Pressure Monitoring Systems (TPMS) of today. The footer of the site features a share on Facebook, a 360 view and a film of the product unveiling at the Frankfurt Auto Show. Another link shows the conversation that is ongoing across multiple social network properties featuring a count of YouTube, Flickr, Twitter and blogs covering the vehicle. The conversation section is very well executed and makes for an interesting way to showcase social dialog. This technique is becoming a standard approach as it was recently featured on the TDI site Audi recently launched. 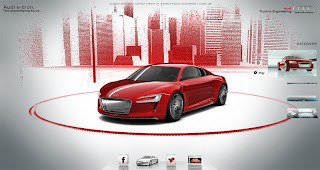 When a social conversation is selected, Audi returns a very nice card that shows the social media content and allows the user to view it on its source site or one can Tweet the content if they so wish. The execution is very nice and one of the best implementations of social media content integration and sharing I have seen. Audi truly is on to showing all sites a very effective to show buzz and allow further sharing through a clean, well-designed interface. It’s too bad that the Audi e-tron site suffers from some difficult navigation. Some proper usability testing would have corrected many of the apparent issues here. Of course, I haven’t put the site through testing, but having done testing on many sites in my decade plus experience, I’m sure the site would have some major hurdles for all but the technically adept or ultra-patient. The big message here is the electric engine in an Audi R8 and whether Audi will really ever build an electric super car, especially after Audi President of North America Johan de Nysschen recently called anyone who buys a Chevy Volt a car for idiots. Where the Audi campaign really shines isn’t this site. The really great work are the viral videos that were created to promote the electricityuntamed.com site. There is a YouTube Channel housing three videos produced to launch the e-tron concept. All three are performing very well for a concept launch. The videos are getting over around 200,000 views each, which may sound low, but relative to most automotive content of similar nature the numbers are pretty good. It’s great having this amount of content for a concept vehicle. Few concept vehicles get this much attention and I'm sure the agency, Venables Bell & Partners, had a great time concepting the effort. We had a similar effort done for our Lincoln C Concept car at the 2009 International Auto Show and it was very well received. I think car companies can benefit by extending the concept experience to a digital space, especially when the vehicle showcases some compelling exterior and interior design elements and technology advancements. The only caution with all of this futuristic design is that website navigation is still constrained to the usability best practices of today and designers should consider the aggravation complex site navigation can cause the average visitor. Be cool, just don't be difficult. Check out the new LFA build site. Talk about poor website.